When the struggle to build a new St. Louis County Courthouse commenced in 1904, it also touched off a debate about replacing the 1889 St. Louis County Jail and Sheriff’s home. Just 15 years old, the jail was considered insufficient in size and was known for its notoriously bad circulation. It also stood next to the 1883 courthouse on the southeast corner of 6th Avenue East and Third Street, so once the new courthouse’s location was set the old jail would stand a mile away from the courthouse, creating prisoner transfer issues. But despite annual demands to replace the old jail, St. Louis County wouldn’t transfer prisoners to a new bastille until 1924. And 60 years later the debate to replace that building (and later what to do with it once it was no longer a jail) would become another epic battle in the history of St. Louis County. In 1907 Duluth adopted renowned architect Daniel Burnham’s plan for a Civic Center, a grouping of city, county, and federal municipal buildings following his City Beautiful movement. Burnham’s plan called for the county courthouse, federal building and post office, and city hall to all sit on a square between Fourth and Sixth Avenues West and First and Second Streets, with the courthouse at the top of Fifth Avenue, terminating the avenue and forcing Second Street to be rerouted. The new courthouse plans included a tunnel from the courthouse to a new jail so that prisoners could be transported safely to and from court. Local officials proposed that a new jail should be built directly behind the new courthouse, but early opponents of this idea said it would be too close to Jackson Elementary School. An idea to make the new courthouse’s fifth floor into a jail were quickly dismissed. Another idea, to move the 1889 jail to the new Civic Center location, was abandoned after it was determined Duluth’s streets were too narrow. 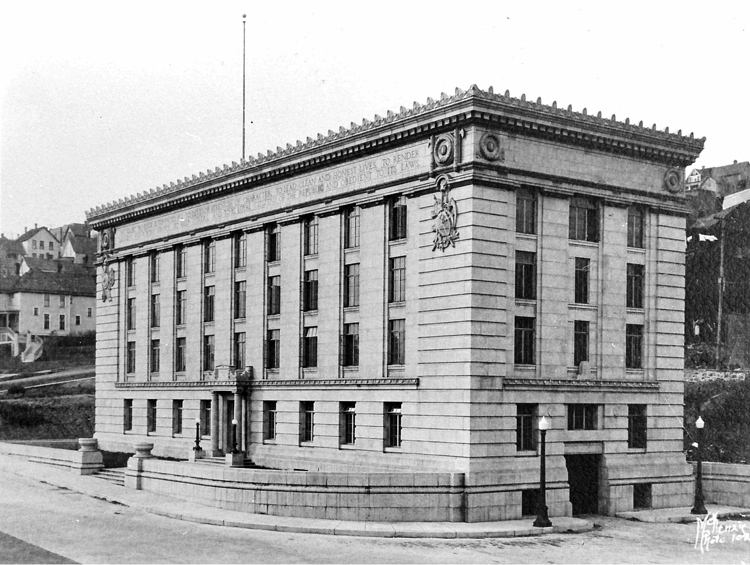 When the new courthouse opened in 1910, the debate over a new jail was far from over. In fact, it went on for another 12 years. Each year a grand jury was assembled to inspect all county buildings, and like clockwork these bodies called for the replacement of the 1889 jail. The Duluth News Tribune was decidedly against the expense of a new building. Each time county official called for a new jail, the News Tribune argued that it was not necessary. The old overcrowded, stuffy jail was fine, the paper said. Its basement could be used for more cells, and if the county would build the sheriff separate quarters, the space he and his wife occupied could also be used to hold prisoners. The paper ignored the logistics of prisoner transfer. Every year the county’s grand jury called for the jail’s replacement, and each year the News Tribune countered with calls to remodel or expand the old facility. The old jail did get some work—a new ventilation system and some fresh paint, and the basement was remodeled to hold more prisoners—but it wasn’t enough. In 1916 the grand jury referred to the annual reports calling to replace the jail as “a joke.” The following year, when the U.S. entered World War I, the jail quickly filled with “slackers,” men of service age who failed to enlist. The Prohibition issue also muddied the waters: would the new law decrease criminal activity, as hoped, or would the penal system swell with those caught circumventing the new law? That year the News Tribune gave in, declaring in November 1917 that the paper had been “pig-headed” over the issue. The county announced a tax levy to pay for construction, and architects “swarmed” the courthouse with plans. But the 1918 grand jury said that while the jail needed to be replaced, the expense could not be justified while the country was at war. It was the same old story for 1919 and most of 1920. Finally, in November 1920, the county announced a new tax levy designed to raise $300,000 for a new jail. By February 1921 the plan was in motion. The county began purchasing properties northwest of the courthouse for the new jail—in 1919 the previously proposed location had become the site of a county parking garage. The entire upper side of the west 500 block of 2nd Avenue East would have to be razed. In March the county received drawings from architects Holstead & Sullivan, German & Jenssen, Kelly & Schefchick, and E. M. Broomhall. The drawings submitted by Abraham Holstead and William J. Sullivan—who had designed Denfeld High School, the original Nopeming Asylum buildings, and later the “Viking stage” at Leif Erikson Park—took home the contract. The new jail would be 80-feet wide by 140-feet long standing three stories tall. Along with the jailer’s office and three tiers of “tool-proof” cells (enough to hold 70 prisoners), the building would include a school room, a hospital, and a detention center for women. A modern ventilation system would be installed. The News Tribune boasted that the jail “will have little of the atmosphere of a place of incarceration.” It seemed like the path was finally clear for the new jail. But it wasn’t. The plans were changed, raising the building another floor—and considerably raising costs. Estimates jumped to $400,000, then $500,00. When it hit $600,000, the Duluth Commercial Club cried foul and asked the county to halt the project. The old work house idea again reared its head, but was quickly dismissed. Plans changed again; the fourth floor became an option for the future, and the price went down to $400,000; by December, that number was down to $375,000. More wrangling occurred after contractors submitted bids in March of 1922, and the best offer was $15,000 over budget. The county literally sent Holstead and Sullivan back to the drawing board. With a smaller footprint, and including a fourth floor, the architects managed to cut the budget by $98,000 while increasing prisoner capacity. The first floor would have a kitchen, laundry, sheriff’s office, and there would be facilities for juvenile offenders. Plans for a basement parking garage, however, were abandoned.